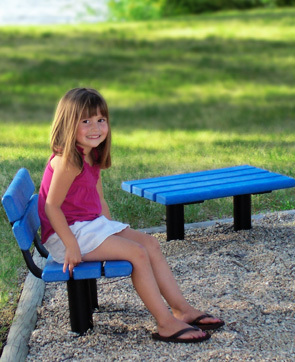 Park Scapes® kids benches are tailor-made for children measuring 24" in length with a seat height of only 10". Featuring rounded bullnose 100% recycled plastic 2" X 4" slats for safety, comfort, and strength. 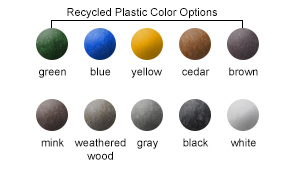 Splinter-free recycled plastic is available in a variety of fun colors that will put a smile on any child's face. Marks from paint, markers, or dirt can be easily removed with either soap and water or a commercial solvent. Available with or without a backrest. Corrosion resistant heavy-duty frame is powder-coated in your choice of colors shown below. Available with portable, surface or in-ground mounting options.